Cool-season vegetables are those that grow well into the fall, providing our tables with nutritious, veggie goodness. These cooler weather favorites are planted toward the end of August and are started from seed. Most of the options available should be started in flats, small pots, peat pots, or Grangetto’s Speedy Roots Seed Starter Trays and transplanted later. A few can be sown directly into the garden. Once you’ve chosen from the wide variety of cool-season veggies such as broccoli, Brussels sprouts, cabbage, cauliflower, celery, kale, kohlrabi, mustard, lettuce, chards, edible-pod peas, radishes, carrots, beets, and others, it’s time to begin planting. Not only can you get all of the supplies you need, such as the Speedy Roots trays, at your local Grangetto’s, you can also get your seeds there. If you’re using pots or flats, you need to disinfect them and fill them with sterilized potting soil. You want to make sure no possible risk of infection is present, or else your sprouts may suffer things such as root rot. Gently put the seeds on top of the soil carefully spacing them where you want them. Press them down gently into the soil. Beets, carrots and radishes can be planted directly into the garden using the same method. Keep your trays moist and in semi-shade. 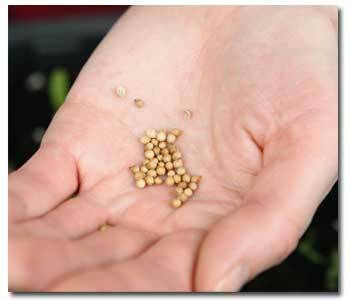 Cover them with plastic until the seeds germinate, after which you can take off the plastic. These sprouts are fragile and need to be protected; netting is an excellent way to do it. The next step is getting your new veggie sprouts used to more light. Over a period of two or three weeks, move them into increasing light and eventually into full sun. You can start feeding the plants lightly when each has two real leaves. Once your seedlings are used to full light, it’s time to transplant them into your garden. Dig small holes deep enough such that the root ball is completely covered. Place each transplant in its own hole and cover with soil. The only thing left to do is water, wait for harvest, and enjoy!